Every once in awhile in the outdoor industry, years of research and development result in a truly remarkable advancement (refinement?) of a concept that elevates the experience of the endurance athlete in harsh weather conditions. The new GORE-TEX Shakedry fabric is exactly this: a revolutionary, durable GORE-TEX Active fabric that represents the most breathable, waterproof, windproof fabric available. This isn’t just an advertising tagline. 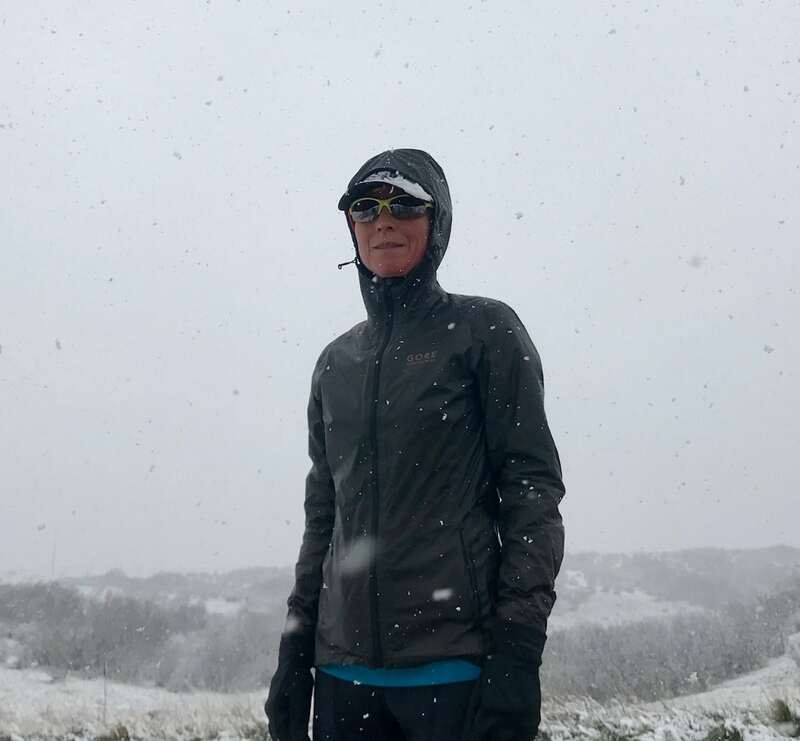 This is also my experience as I’ve tested three jackets that incorporate this material since January. I’m completely and thoroughly impressed. Shakedry is GORE-TEX’s new laminate construction with only two layers: 1. The smooth, thin GORE-TEX membrane upon which all external moisture beads up and shakes or brushes off; and 2. The slightly textured inner functional backer textile which has a water-repellent surface, is highly breathable, and retains a comfortable next-to-skin feel regardless of the weather. There is no ‘face fabric’ to soak up water and therefore the jacket doesn’t get heavier the longer the precipitation falls. The vapor transmission from inside the jacket out is incredible which greatly reduces sweat accumulation while running or engaging in any other highly aerobic activity. The overall breathability is really impressive. You can feel the air circulate as you run, and yet the chill of a stiff wind is eliminated. This also ensures that any moisture that does build up inside the jacket and any beads of external precipitation that doesn’t immediately fall off dry very, very quickly. I’ve not experienced this level of climate control from a waterproof jacket ever before. 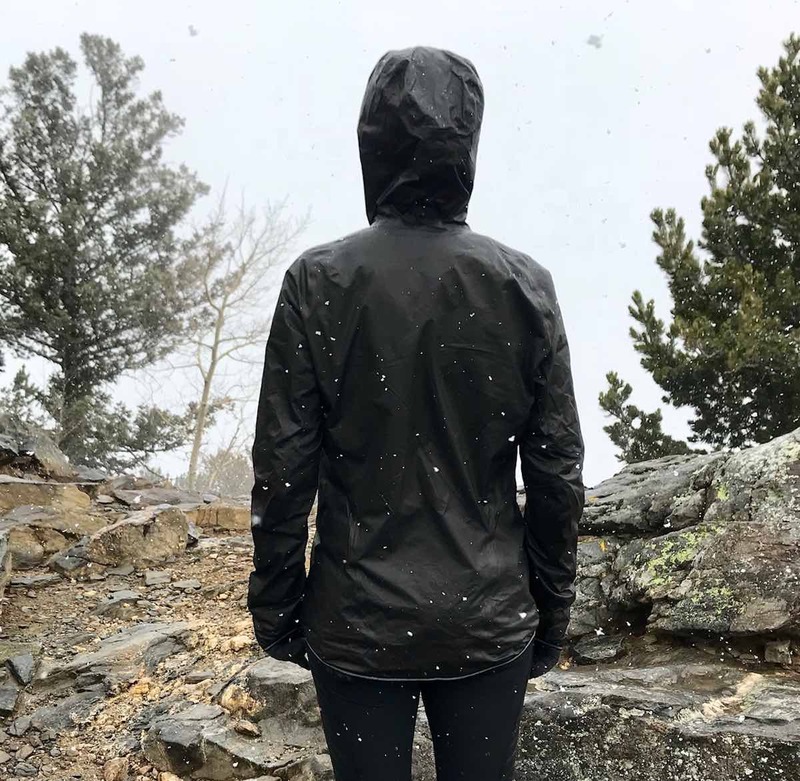 This technology eliminates the need for carrying a wind jacket in addition to a heavier rain jacket in your running pack—you simply need one Shakedry jacket, and you can use it effectively as both. Each of the three jackets I tested are exceptionally lightweight (around 4 to 6.5 ounces) and packable—down to the size of a half-sandwich—and each jacket came with either a small stuff sack or designated pocket to stuff it into. I wore packs over each of them on various runs and fat-bike adventures and none of them show any signs of wear or tear. That’s pretty impressive durability for something so ultralight. Of course, this technology doesn’t come cheap, but if I was updating only one piece of gear for my mountain trail adventures, this is where my money would go. Each jacket I tested is constructed with the GORE-TEX Shakedry material but the fit and features do vary. Read on as I discuss the similarities and differences more specifically of each jacket. 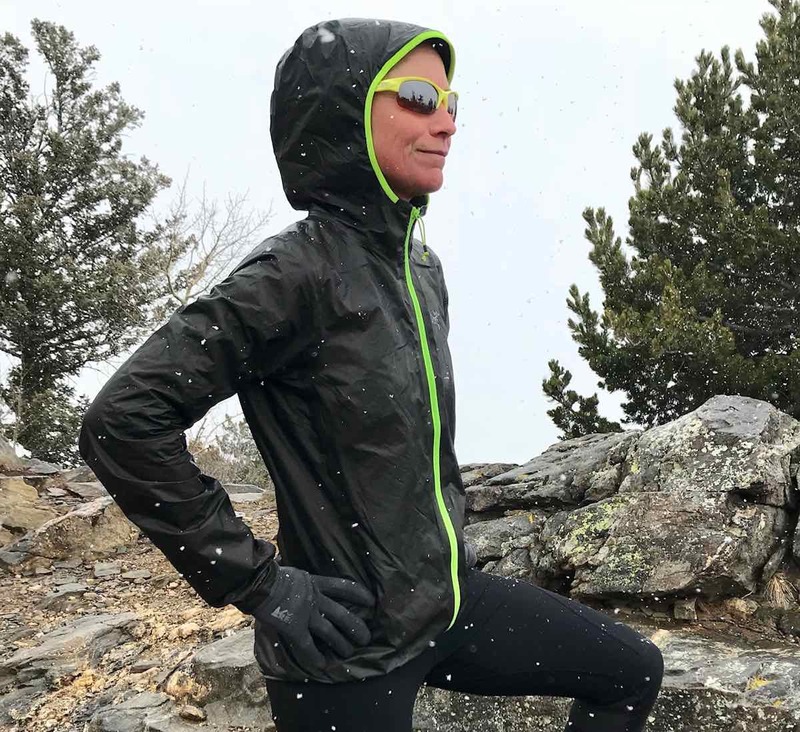 The Arc’teryx Norvan SL Women’s Hoody ($299) is a relatively slim-fitting, ultralight jacket with slight ‘feminine shaping’ through the waist. Both the men’s and women’s jackets are matte black (with and without a hit of color via the zipper) and feature an elasticized reflective hem and partially elasticized reflective wrists which are slightly lengthened over the back of the hand. These features provide an effective way of sealing out gusty winds and preventing the jacket from billowing. My only suggestion here is to make the sleeves about two inches longer. 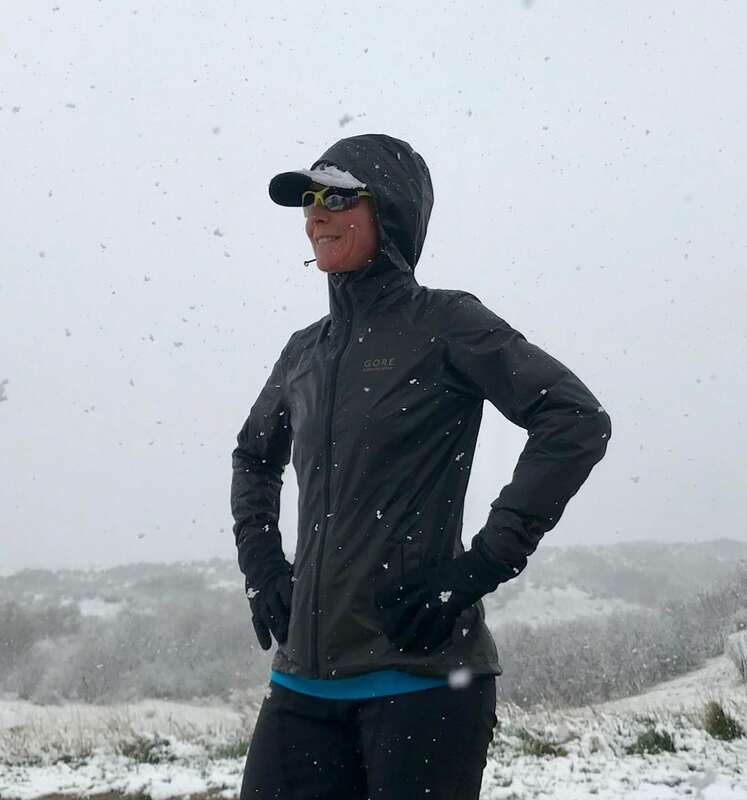 I don’t have particularly long arms, but I love being able to pull my hands up inside the sleeves when I’m running cold—I know I’m not the only one. I can just barely fit my hands inside without pulling across the back of the jacket. Another two inches would allow for those with longer arms to still be comfortable and well-covered and would enable those of us who use jacket sleeves as second glove layers from time to time to be able to do so. The easy-pulling WaterTight zipper has a strip of the Shakedry fabric directly behind it which keeps the precipitation out rather well. Surprisingly, there’s no zipper garage at the top of the zipper. I always feel like this should be a mandatory feature on a jacket that’s going to protect you from nasty weather, but with the reinforced fabric where the hood joins in with the zipper, my chin stayed free of abrasions even in blizzard conditions and swirling winds. The hood is slightly elasticized around the face and has a very slight shaped brim over the forehead, but other than a draw cord in the back which cinches it at the base of your skull, I’m unable to really snug it down to my face. This hood accommodates my ponytail but is most effective over a wool beanie or, even better, your brimmed hat as it doesn’t quite provide enough form-fitting protection on its own, especially if it’s blustery. I’d love to see a more substantial brim and ability to cinch the hood more snuggly around my head. Arc’teryx Norvan SL Women’s Hoody back view. I received a small in this jacket which was appropriate according to the size chart, and I’d say it fits true to these measurements. It’s just roomy enough to layer a base layer and a thin synthetic puffy beneath, and there’s also enough stretch in the fabric that I can move my arms and torso in any direction without feeling restrictions. I can’t quite fit the jacket over my pack with water bottles on the front, but simply sizing up would fix that if it was important to you. Amazingly, the Norvan SL Hoody easily stuffs into a small sack with a draw-cord closure attached to an interior loop in the jacket and when fully packed is about the size of a deck of cards. I love having Hardrock 100-worthy protection in one of the small zip pockets in my pack. I have to say even with my suggestions for improvement, this is perhaps my favorite waterproof breathable jacket of all time. Arc’teryx Norvan SL Women’s Hoody side view. The North Face Hyperair GORE-TEX Women’s Jacket ($250) is a slightly heavier and more straight-cut version of the ultralight waterproof/breathable jacket made from the same matte black Shakedry material. Waterproof polyurethane zippers are utilized for the main zipper (with a zipper garage to protect your neck and chin) as well as the pocket at the back of the jacket which easily holds a bar, gels, or phone. Though it adds a bit of weight, I personally like having a pocket for a few essentials should a pack not be necessary. I’m not sure the rear pocket was designed as a stuff pocket for the jacket, but it does indeed work for more consolidated organization in your running pack. The zipper doesn’t allow for reverse closure however, and the size is approximately two full decks of cards. The North Face Hyperair GORE-TEX Women’s Jacket front view. 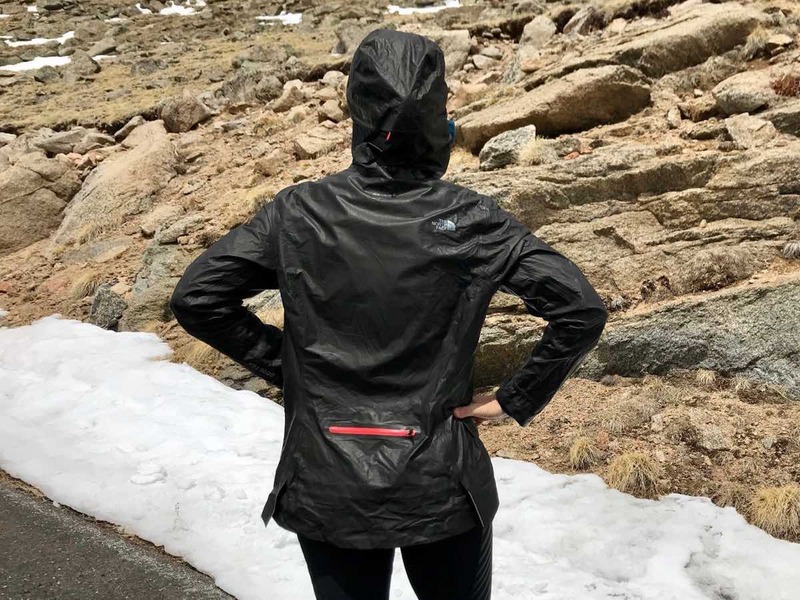 The hem of this The North Face jacket has two rear side vents with reflective edging to allow more mobility and less of the ‘mermaid fit’ look but still offers a draw cord that allows you to cinch the hem down when the winds kick up. The wrists are again partially elasticized and slightly longer over the back of the hand. Long-armed women beware—these sleeves are rather short proportionally when physically active. When standing with my arms long by my side (I’m 65 inches tall), the sleeves reached the middle of the back of my hand, but when running, they slide up the arm a bit more and leave my wrist bones unprotected. I’m wondering if this has to do with less anatomical shaping of the sleeves? To these sleeves, I’d add two to three inches in the next version of the women’s jacket or I’d create slight shape at the elbows so that the position of the arms while running doesn’t effectively shorten the jacket sleeves to the same extent. The hood on the Hyperair jacket is shallower than the Norvan SL but has a more substantial brim… if only it extended over my forehead which it does not. As it is, adding a full Buff or a brimmed hat is the only way this hood provided much protection for me at all. The elasticized sides of the hood allowed for a bit more of a snug fit around my face, and the pull cord is available to cinch the hood around the base of your skull. I received a medium in this jacket which, according to their fit finder and my measurements, is my true size. I wouldn’t have wanted it any smaller as the slightly roomier fit allows me to layer a compact down puffy beneath it for colder days but still is comfortable over a thin wool base layer. I can fit this jacket over my small three- to five-liter packs even with front water bottles, but it’s a squeeze. Again, I’m so impressed by the excellent protection offered by the GORE-TEX Shakedry material in this jacket. A few tweaks to the design and this is on my frequent rotation list. The North Face Hyperair GORE-TEX Women’s Jacket side view. 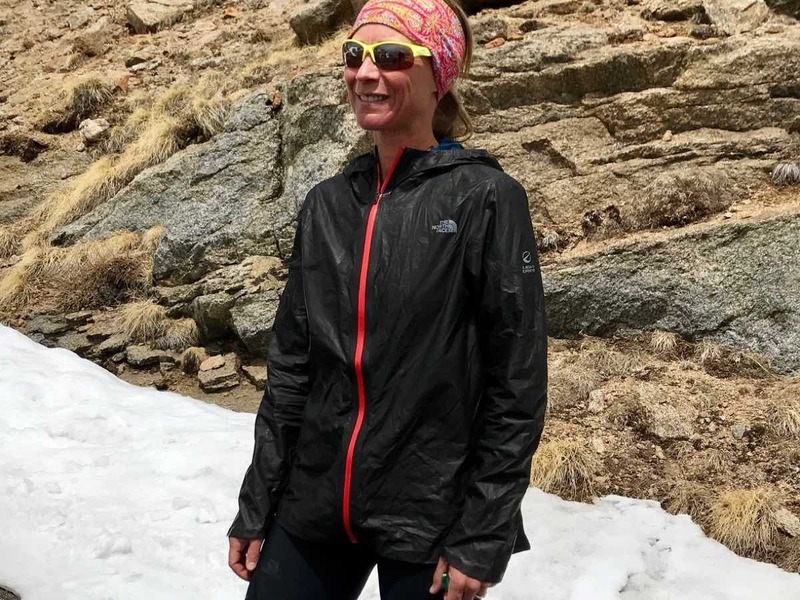 The third and final ultralight jacket in my roundup, the Gore One Lady GORE-TEX Shakedry Running Jacket ($300), again features a women’s-specific cut in the version I received. The slight taper at the waist coupled with the draw cord at the hem does well to prevent drafts with higher winds and keeps the jacket close to the body. The elastic cuffs at the sleeves fit perfectly over gloves or without and accommodate a larger sports watch beneath. Again, I found the sleeves to be barely long enough to adequately cover my wrists. Let’s add two to four inches to these sleeves as well for women with longer arms and for the purpose of some extra hand protection when the chill sets in. This was the lightest-weight jacket in the group despite featuring two zippered hand pockets on the sides. I found them perfect for fuel and a key but not quite substantial enough for my phone. These zippers as well as the main one up the front are water resistant but have a Shakedry liner which prevents the precipitation from leaking in. The main zipper also has a gutter at the top for protection which makes my neck and chin happy. Gore One Lady GORE-TEX Shakedry Running Jacket back view. The hood on the Gore One Lady jacket was the best of the three at snugging up around my face thanks to adjustable pulls on each side. Unfortunately, it has no brim at all, so in a storm, the addition of a brimmed hat was key for protection. The hood moves well with your head and stays in place as you look from side to side which is a nice perk. I received a medium in this jacket which was also true to size on the Gore chart. I find their gear to fit smaller in general than many other brands, so do keep this in mind and always order up if you’re not sure. It’s the trimmest fit of the three jackets but still layered well over a thick wool/fleece hoody, and stayed comfortable over a simple base layer. Gore One Lady GORE-TEX Shakedry Running Jacket side view. 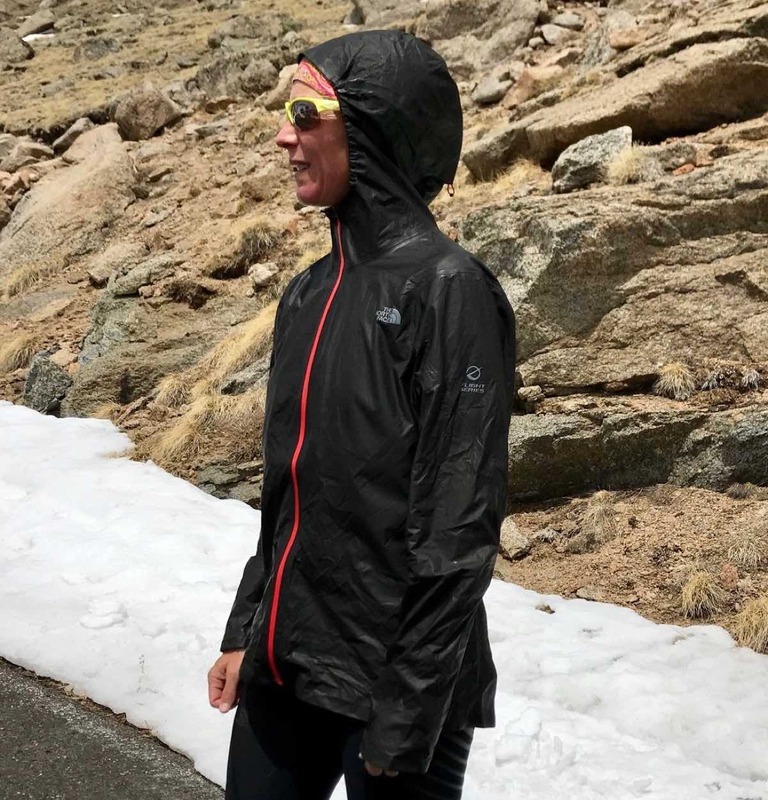 Overall, the GORE-TEX Shakedry fabric is my favorite waterproof/windproof jacket material for high-level aerobic endurance activities on the market. It has replaced the others in my pack for almost all my mountain adventures, and I’ll be carrying one when I pace my sister at her first 100 in a few weeks in the southern Sawatch Range and around Monarch Pass with the Colorado monsoon season in full effect. She’ll be carrying one, too. 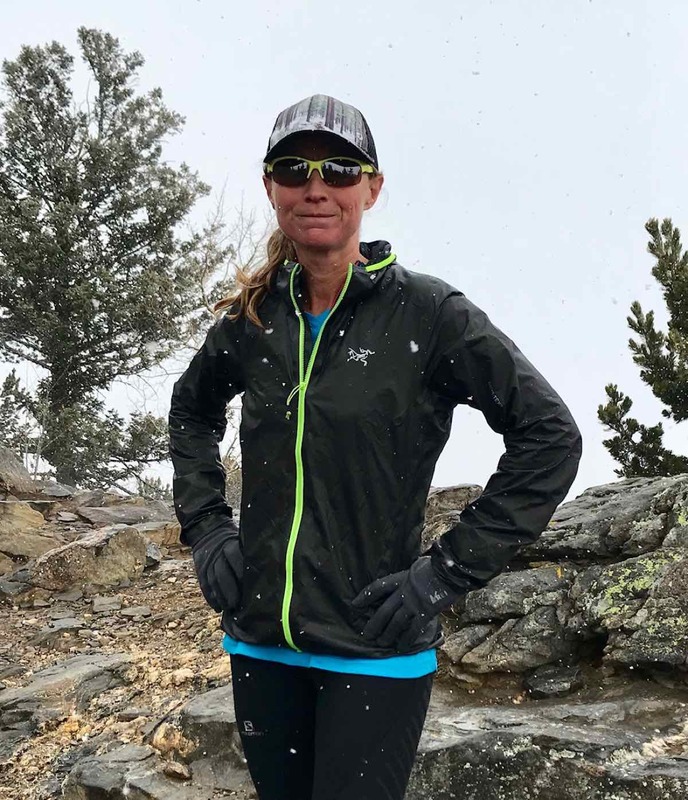 I think there are some easy fixes on the designs from the three companies as I’ve mentioned above—namely longer sleeves and improvements in the hood—but if you find the fit that works for you, you simply cannot beat the performance, climate control, and comfort you’ll enjoy in about any weather the fickle trail running universe will throw your way. As soon as the storm passes, the jacket will be dry, you won’t have sweated through, and you’ll continue your journey paying attention to everything but the jacket you’re wearing. Have you tried the GORE-TEX Shakedry fabric yet? If so, what do you think? What about any of these three specific Shakedry-bearing jackets, have you run in them? Can you share your experiences? “Arc’teryx Norvan SL Hoody” should be in the title, too? We titled it according to the new material used in the three jackets. Sub-title headings are the 3 jackets. In the shop they told me that you should not wear the jacket with a backpack, as the backpack could harm the material. Any experiece? I’ve been wearing the jackets under my running packs without issue thus far and see no wear and tear, but it’s early in the process as I plan these to be many-year jackets. I suppose ideally I’d wear them overtop my running pack, but only one was large enough to do so. I have no experience wearing them under a multi-day backpacking set up but perhaps someone from Arcteryx, The North Face, Gore, or Gore-tex could chime in. 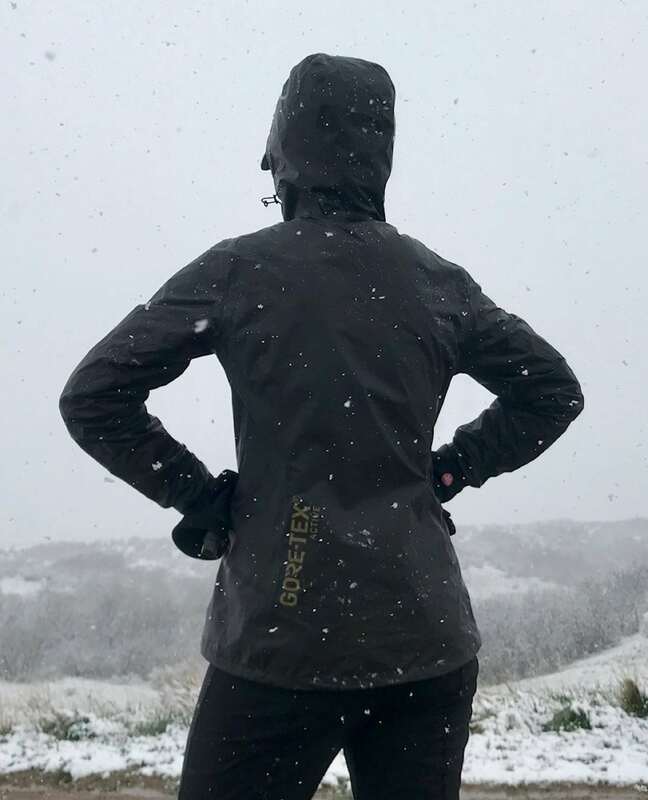 If you want to use a Shakedry jacket with a pack (for Ultras etc) it could be worth checking out the Dynafit Ultra Gore-Tex Shakedry Jacket 150 which features a zip on the back so as to expand and fit OVER a pack. I’ve not got one but must admit I’m tempted because it’s annoying in changeable weather when you have to keep putting your jacket on & off, and having to take your pack off every time also! Which one would you recommend for tall/long torso women? Likely the arcteryx one… but I wouldn’t be opposed to the men’s small for me (women’s medium) just for the extra length. It’s also nicely tapered but w longer arms. My sister is taller and w longer torso/arms and the men’s is a great length for her. The north face is boxier if you like less taper. Hi Meghan, interesting roundup. Two years ago, I received my first Gore-Tex Shakedry. I love it as an effective shield against wind and rain, also breathability is perfect and hood fit is great. But durability is a demerit, espacially when you want to wear in combination with a backpack. Gore-Tex folks told me, that it’s not made for backpacking. Nevertheless I tried it with a Salomon S-LAB Sense Ultra 5 Set. But after a 4-hour-run I found a cut. Shoulder zone was damaged. Anyway, this jacket works really great in rainy and windy conitions. Especially when it’s not really cold and you need high breathability. Any idea what the difference, if any, is between the shakedry and the active 2.0? I have a Mountain Equipment Impellor in the latter and so far I’m very impressed. – @KristinZ: I have no problems with length of the arm-sleeves (but I’m judging the male version, where you seem to be commenting that it has longer designed sleeves). They do fall about half-hand, longer would maybe give a bit more protection in the real bad weather, but I like m like this, as you can (because they’re elasticated) pull m up to half your underarm when the weather is not to bad but you want to keep the jacket on. – @KristinZ: mine does not have the mentioned strip behind the zipper (maybe there has been a small design iteration in the years in between), and this is exactly my 1 criticism as the zipper is just not as waterproof as the rest of the jacket. Happy to see this changed! – @Alexander, @zzzz; I’ve had the same caution with using it with a backpack as you’re stating. I checked with A’T and they told me it should be fine unless with pack loaded up to the max. I’ve used it with various running vests on multiple ultras up to 24 hours without problems. I have yet to find any chafing marks or the like. Just to be clear; these are of course lightweight running vests, with ‘real’ big packs for multiple day hikes I would still be cautious, but in that usage scenario you just might opt for a jacket with more functionality anyway. – @Mike; I have to comment that you’re statement of having to take your pack off and on every time you change jacket indeed was a concern of me as well. However I’ve found this fabric to breathe so well that you really substantially take the jacket off so much less that I now find it to be no issue. I also own the ‘standard’ Norvan jacket, sized up exactly for this reason to fit over a running vest. So my plan was to take the Norvan SL as the lightest possible ’emergency’ rain-jacket and the standard Norvan on days with bad weather announced. In reality the SL has become my choice for every weather situation. If anyone has another more specific question just let me know. Do you know if the norvan sl itself got updated the last years? I also feel that the permanent surface gets soaked easier then in beginning i received the jacket, but not sure..
I’ can not judge the intensity you use your jacket but I’ve been using my SL for the best part of 3 years now. The fabric on the cuffs is visually chafed, but I have no issues with the main fabric. I do take care handling the jacket though. I think the jacket has been revised but just a few design changes, no other ‘main’ fabric. I do also own the ‘normal’ Norvan, but I have to say that is a way more ‘traditional’ GORE-TEX garment. Although very well minimalistic designed and superbly built it really is not the same as the SL when looking for the ultimate lightweight breathing jacket. For runs I take the SL, for hikes or other multi day adventures I take the ‘normal’ Norvan.